So, what’s new with Clayton Kershaw? He pitched his second complete game in a row — a 2-1 victory (the Dodgers’ sixth in a row) over Atlanta that was a shutout for the first 26 outs. He has 150 strikeouts and 15 walks this season, for a 10.0 K/BB ratio. He has a 1.71 ERA in 2014. He has allowed 12 earned runs in his past 99 innings. Taking out my trusty abacus … that’s a 1.09 ERA. In his past 506 innings, dating back to June 2012, Kershaw’s ERA is 1.99. No silver bullet explains why Matt Kemp has started to look more and more like the elite player of his peak. He’s feeling healthier, but not the way he was in his near-MVP 2011 season. He’s in a good place at the plate, but he still feels he needs to get better. By now, Kemp knows too well the ups and downs of baseball, so he’s hardly kicking back and saying his comeback is complete. Matt Kemp is having a week. With a game-winning RBI single in the bottom of the 10th tonight, Kemp drove the Dodgers to their fifth victory in a row, 3-2 over Atlanta, and extended his recent dominance. Kemp is 6 for 8 with three home runs, four runs and six RBI in his past two games. He now has a .353 on-base percentage and .465 slugging percentage this season. Kemp’s wRC+ is now 133. It’s better than his career avg. It’d be third best year of his career. Top-35 in baseball. Following a best-in-his-Dodger career 13 strikeouts in eight innings from Zack Greinke and two runs from Kemp — one in the second inning on his latest homer, the other by racing from second to home on a Juan Uribe infield single to break a 1-1 tie in the eighth, the Dodgers were within three outs of a tidy 2-1 win. But then Kenley Jansen allowed his first run in 14 games to start the bottom of the ninth, a home run by Justin Upton. Consequently, the Dodgers found themselves playing their first extra-inning game at Dodger Stadium since May 11. The Dodgers played 10 extra-inning games in their first 39 games of 2014, then one extra-inning game in their next 68 games before tonight. 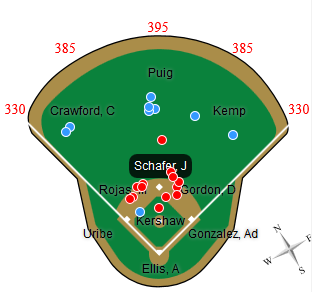 Atlanta threatened in the 10th, but shot itself in the foot when J.P. Howell picked Jordan Schafer off second base with one out. And then came Kemp. Again. Victory march: What comes after four? So now that the Dodgers have won four games in a row, I’m guessing the next thing you want is five. You fans, you’re so incorrigible. Well, the last time the Dodgers won five games in a row, they won six. That was from August 28 to September 3, completing the team’s bold 53-13 run from 30-42 (and 9 1/2 games out of first place in the National League West) to 83-55. This year’s Dodgers — whom, it should be noted, haven’t been below .500 all season — are 28-16 (.636) since falling 9 1/2 games behind San Francisco. Earlier today, the Giants ended their six-game losing streak by rallying to defeat Pittsburgh, 7-5. Trivia: Who are the three Dodgers this year with more triples than home runs? Answer below. 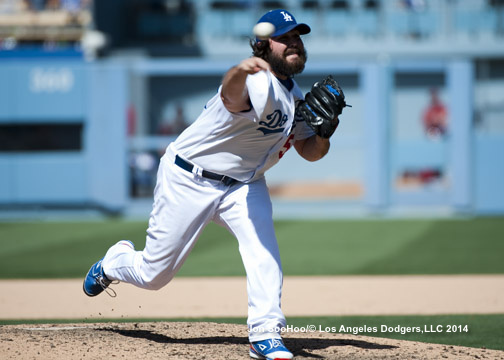 Don Mattingly told reporters today that after Zack Greinke pitches today and Clayton Kershaw on Thursday, he plans to start Dan Haren on Friday — Haren’s first start since July 23. Hyun-Jin Ryu on Saturday will pitch on five days’ rest. Brim also looked at Kenley Jansen’s increased and effective use of the slider. How dominant is Clayton Kershaw? Answer No. 4,123,259: Kershaw has a higher on-base percentage while batting than he has allowed while pitching. Here’s a close inspection of Yasiel Puig’s three triples Friday, from Steven Silverman at Beyond the Box Score. Trivia answer: Dee Gordon (10 triples, two homers), Andre Ethier (five triples, four homers), Miguel Olivo (one triple, zero homers). Scott Elbert will be 29 next month, and he has spent the past 10 years in the Dodger organization since being drafted in the first round in 2004. On Tuesday, the Dodgers designated Elbert for assignment, temporarily halting his bid to come back from multiple surgeries since his last Major League appearance in August 2012. Elbert’s rehab this summer has taken him to Ogden, Rancho Cucamonga and Albuquerque, together adding up to 12 2/3 innings with 13 strikeouts while allowing nine hits and seven walks. 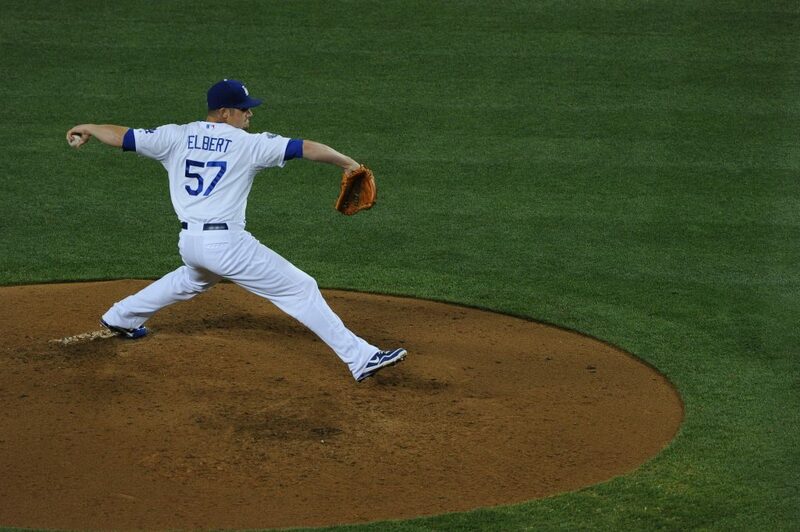 In his final two Major League seasons with the Dodgers, Elbert had a 2.32 ERA from 2011-12 with 63 strikeouts in 66 innings against 54 hits and 27 walks. Elbert could return to the Dodger organization if he isn’t traded, clears waivers and accepts a minor-league assignment. Live online today, you can watch Vin Scully’s media availability to discuss his return to the Dodgers for the 2015 season. The presser is scheduled to begin at 3:45 p.m. The Dodgers have optioned newly acquired Darwin Barney to Triple-A Albuquerque and completed their trade for the infielder by sending Single-A Great Lakes right-hander Jonathan Martinez to the Cubs. The 20-year-old Martinez has a 3.47 ERA in 19 starts this year, with 91 strikeouts in 106 1/3 innings against 129 baserunners. So why did Vin Scully choose to come back to the Dodgers in 2015 for his record-setting 66th season? “I wanted to wear Yasiel Puig’s jersey,” Scully joked to SportsNet LA’s Alanna Rizzo. Scully added that he didn’t want to overemphasize the role that his wife played in the decision. It’s a partnership. “The one thing I know Sandi is very sensitive about, if I talk about it, is that she doesn’t want to let people think that she’s making a decision as to whether (I come back). But we try to do everything together that we possibly can. And I’ve been enriched by the fact that she’s been coming to more games — sitting in the booth — and I’ve loved that. “We sat and we thought, ‘OK, let’s try it one more time at least,’ and so, here we go again. Scully said the Dodgers’ winning or losing did not affect his decision, making clear that “it’s the people” who mean the most to him. “It’s really my home away from home,” he said. “And that’s one of the things I’ve tried to do — is to have Sandi come and share some of the experiences, meet some of the really nice people. Yasiel Puig singled, doubled and tripled in his first three at-bats tonight, setting up Dodger fans, who have already seen two no-hitters this year, for a new piece of history. Instead, the happy crowd settled for Vin Scully’s 2015 return, the first four-game winning streak of the Dodgers’ season and an expanded lead in the National League West. Viva Vin! Scully to return to Dodgers in 2015! It’s true, it’s true. 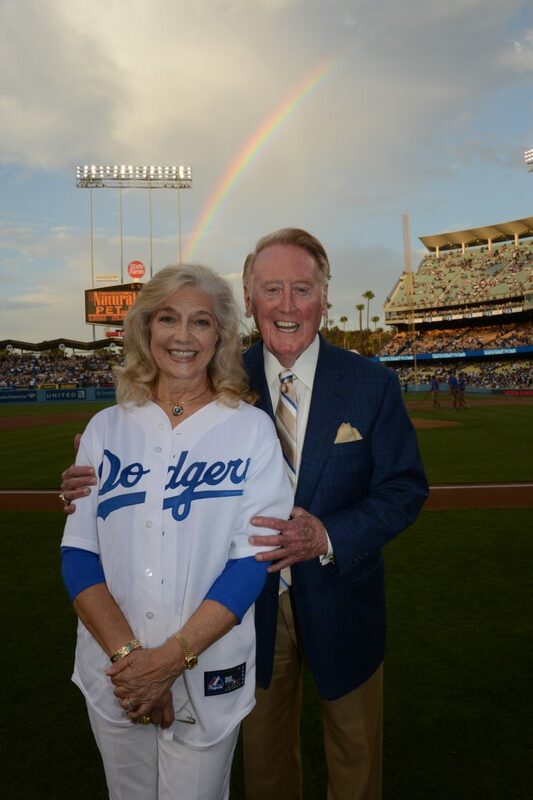 Vin Scully will be back to broadcast Dodger games in 2015 for his 66th season. The Dodgers announced the news tonight in the middle of the second inning of tonight’s game against Atlanta, with a message first to fans from Hyun-Jin Ryu in Korean, Yasiel Puig in Spanish and then Justin Turner in English. The roar from the crowd was deafening. Scully also offered this insight into the year’s most anticipated decision. 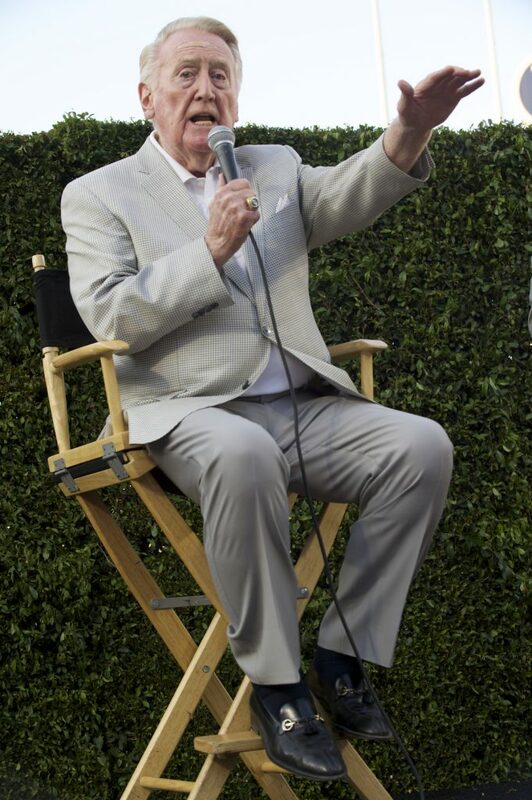 The greatest at his profession of all time, Scully will continue to call all nine innings of the Dodgers’ television broadcasts on Time Warner SportsNet LA, with the first three innings of each of his games also simulcast on the radio. To put Scully’s Dodger career in perspective, more than half of it has taken place since he earned National Baseball Hall of Fame status by receiving the Ford C. Frick Award in 1982. And he just keeps going, remarkably. We’re so happy to have him back. Asked to explain the key factor in the Dodgers’ sweep of San Francisco this past weekend, Clayton Kershaw replied with a laugh. Though there’s no doubt some are inclined to take him seriously, Kershaw was clearly joking. While it’d be nice to think that there is a magic lineup that would make the Dodgers unstoppable, a bigger reason for the sweep was probably a different decision that Mattingly & Co. made, setting up the Dodgers’ top three starting pitchers to face … not the Giants’ top three starting pitchers. On behalf of the Dodgers, team president and CEO Stan Kasten spoke tonight in favor of a proposal from a group of six California-based members of the U.S. House of Representatives, led by Brad Sherman, calling for binding arbitration between Time Warner Cable and potential carriers that would enable immediate distribution of 24-hour Dodger channel SportsNet LA to all available homes in Southern California. Time Warner Cable also said it would submit to binding arbitration with potential distributors of SportsNet LA (including DirecTV, AT&T U-verse, Charter Communications, Dish Network and Verizon Fios), effectively taking the negotiations out of Time Warner Cable’s hands. Kasten’s words followed an affirmative response from Time Warner Cable earlier in the evening to the proposal from the Sherman group. Earlier this evening, a letter sent to the chairman/CEOs of DirecTV and Time Warner Cable by U.S. representatives Sherman, Janice Hahn, Gloria Negrete McLeod, Alan Lowenthal, Grace Napolitano and Karen Bass was released, outlining the proposal. It followed a recent letter from eight members of Congress, led by Tony Cardenas, that asked the FCC to mediate the gap between TWC and potential distributors. “While such mediation would be helpful, it would not be binding or certain to resolve the dispute,” Sherman’s group wrote. “Now, on behalf of Dodgers fans throughout Southern California, we urge that Time Warner Cable, DirecTV and all other TV providers enter into binding arbitration, so that a neutral third party can determine the right price and terms for the Dodgers network. This will be a fair and fast way to return programming to consumers. Chris Perez discussed his mechanics issues with Pedro Moura of the Register. It’s worth it to read the whole piece to better understand Perez’s journey. Scott Van Slyke’s performance this season gets an in-depth analysis from Stuart Wallace at Gammons Daily. Alex Guerrero spoke in Albuquerque last week with Eric Stephen of True Blue L.A. about how he’s doing and what he’s thinking. Erisbel Arruebarrena is now with Single-A Rancho Cucamonga after a tumultuous weekend. On a rehab assignment with Triple-A Albuquerque, Arruebarrena was a central figure in a 10-ejection brawl Saturday between the Isotopes and Reno, as Ken Gurnick of MLB.com notes. Arruebarrena was officially activated from the disabled list and optioned to Rancho the next day. MLB.com has updated its overall Top 100 Prospects list and its top 20 for the Dodgers. Recent draftees Grant Holmes and Alex Verdugo debuted at No. 4 and No. 10 with the Dodgers. Clayton Kershaw joined Sandy Koufax as a winner of the Hickock Belt. For the backstory on what this is and what it means, go to Ernest Reyes at Blue Heaven. 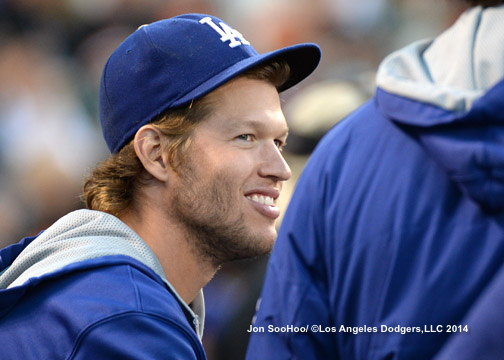 Kershaw will also be a guest on “Jimmy Kimmel Live” tonight. Here’s a clip from his appearance there a year ago. Former Dodger outfielder Tony Gwynn Jr. has been released by the Phillies. The Dodgers have picked up defensive specialist Darwin Barney and cash considerations from the Cubs, in exchange for a player to be named later or (not to be redundant) cash considerations. Barney had a .265 on-base percentage and .328 slugging percentage in 217 plate appearances for the Cubs this season and has a career OBP of .290. A second baseman with brief experience at short and third, the 28-year-old Barney won a Gold Glove in 2012 and shares the MLB record with 141 consecutive errorless games at second. According to Fangraphs, Barney has been the No. 1 defensive second baseman in the National League this year with a UZR/150 of 15.5.